The upper Midwest experienced a deluge of rainfall and flash flooding over the weekend that caused 60 sinkholes in Michigan and other damage. At least six inches of rain have caused major problems in Michigan’s Upper Peninsula. In addition to the sinkholes, flooding has washed out numerous roads, according to Michigan Live. Local coverage of the storm shows how roads have nearly disappeared due to the flooding, while others have been severely damaged. The National Weather Service issued a flood advisory for Houghton County, Michigan, on Monday, for people who live near the Sturgeon River. “Residents along these rivers should remain alert and exercise caution when walking near riverbanks,” the National Weather Service warned. A 12-year-old boy in the city of Houghton, Michigan, was injured when a portion of his house collapsed into a sinkhole, according to The Detroit News. Michigan State Police posted aerial photos showing the destruction caused across the Upper Peninsula, including one image showing where a sinkhole toppled the tall sign of a Taco Bell restaurant. “We have bridges washed out, roads that have been washed out, homes that have been destroyed…and it’s still ongoing,” said Houghton Police Department Lieutenant Nicholas Roberts to Newsweek. Michigan Technological University posted a photo of water coming halfway up the door of one of its buildings. The National Weather Service has issued a flash flood warning for Houghton County. Heavy rain has caused flooding, making travel dangerous. Campus is closed. Please do not try to drive to campus until further notice. Michigan’s Governor Rick Snyder said that the State Emergency Operations Center was activated Sunday to help deal with the situation. Snyder’s office did not immediately respond to a request for comment. The Portage Health Foundation, a community nonprofit hospital system in the Upper Peninsula, has created a charitable fund to help people in the area affected by the disaster, found here. Donations must be marked with "flood relief." 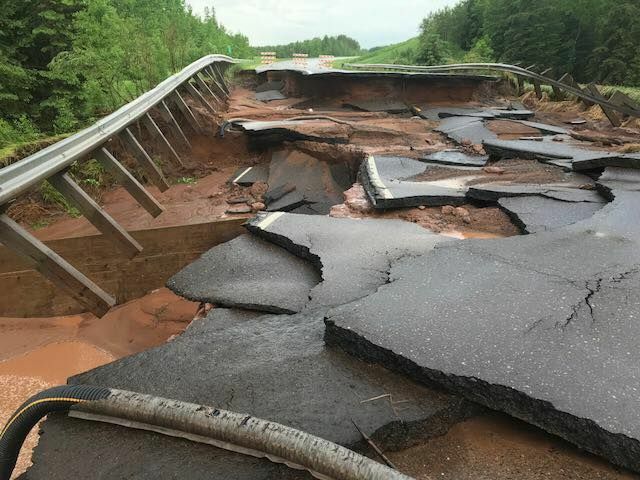 Flooding also affected portions of northern Wisconsin and northern Minnesota, causing washed-out roads and damage. The Minnesota Department of Transportation reported that a stretch of Highway 23 was washed out due to flooding and that several other highways had to be closed. Minnesota Public Radio reported that portions of the state received over 6 inches of rain. Flooding has also affected portions of Wisconsin, which shut down stretches of highway. Officials across the three states have asked people to limit travel.